I got a confession to make. One that took me years to realize and to fully accept. I can't live without RICE. Wow! That felt so good to put it out there. Well, I'm Asian and I grew up in the Philippines. Naturally, rice has been one of our staple in almost every meal (breakfast included). For years, I never reallly thought that I love it THAT much but living abroad, I would find myself choosing rice over noodles, rice over bread, rice over salad, rice over pasta... well that's still an ongoing debate. Anyway, you get the point. I pretty much can't live without rice. 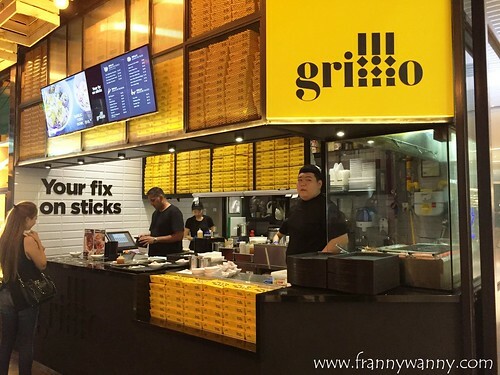 So, when I chanced upon Grilllo at PasarBella in Suntec City and got to try some of their dishes during their opening day, I knew that this is one stall that I'll go back and visit regularly. What's there not to love? 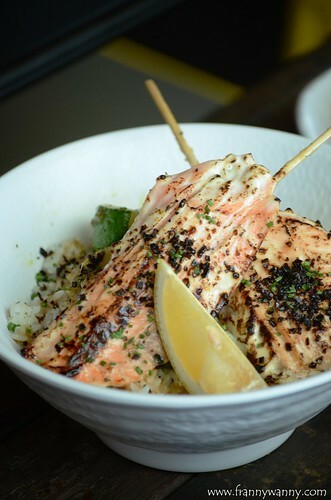 Grilllo specializes in Pan-Asian classic rice bowls with a bit of modern twist here and there. Let me show you some of the rice bowls that Paul and I tried and what were the ones that we loved. Starting from their most popular menu item -- Truffle Short Rib Bowl (S$14.90). We both loved the thinly-sliced tender steak that sits on top of a generous portion of fluffy white rice and served with soft-boiled egg and garlic chips. Of course, what made this special was the strong aroma of truffle oil coming from their homemade Truffle Wafu Sauce. It was so yummy! While I'm not really a fan of soft-boiled eggs, this one turned out okay as it gave the rice bowl a nice creamy texture. 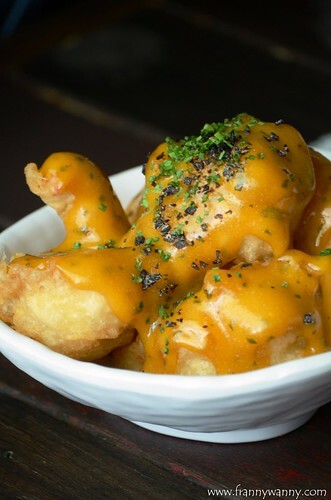 Talk about savoring the umami goodness in every bite. Next was the Yuzu Salmon Bowl (S$12.90). Admittedly, I'm more of a seafood fan more than anything so there's a higher chance that I'll be ordering this more often than the beef bowl. I love how juicy and tender the salmon was and the size was pretty big too. It has a slight tangy kick since the sauce drizzled on top of this rice bowl was the Yuzu Aioli sauce and it's served with a slice of lemon should you want a stronger citrus flavor. I do so I sprinkled the lemon juice away! For vegetarians or those who are not in the mood to have meat, there's the Garlic Tofu Bowl (S$10.90). This is probably the only bowl that I wasn't too crazy about as I do not like tofu in the first place. 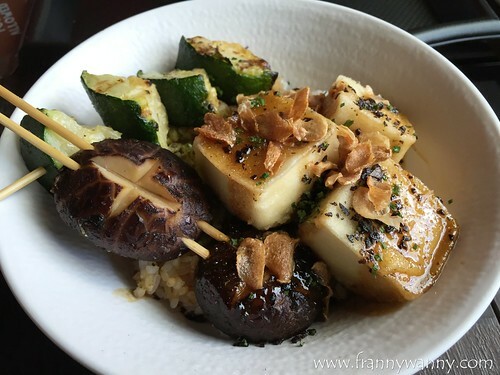 Paul commented though that the tofu was very silky and he loved the shiitake mushrooms that were served together with it. 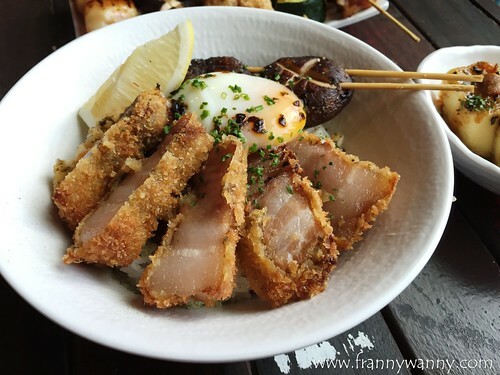 The last rice bowl that we tried was the Pork Belly Bowl (S$12.90) which is a modern take to your katsudon as it made use of Nagano pork belly and deep-fried till golden. 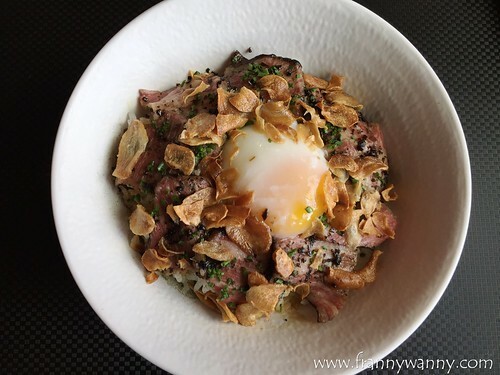 It's served with shiitake mushrooms and soft-boiled egg which all sit on top of fragrant white rice. I hope this becomes a regular item on the menu as it's sure to satisfy your crunchy, meaty daydreams. As every superhero must have a sidekick. 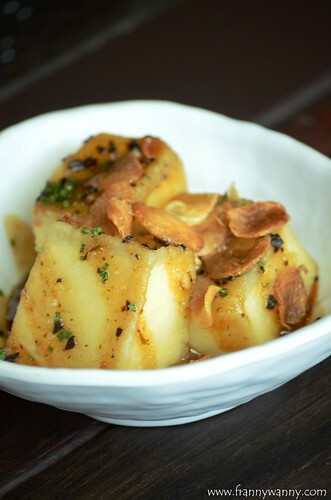 All these delicious rice bowls also have a couple of side dishes that you can enjoy it with. The Golden Crunch Prawn (S$6) is something everyone here in Singapore will surely like. 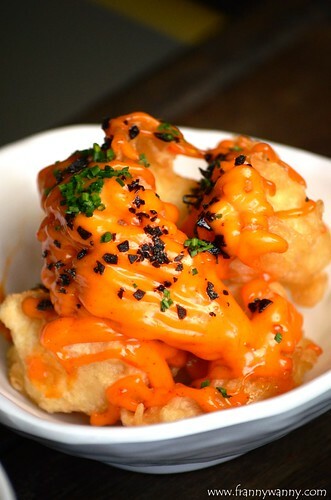 After all, it's plump, deep-fried prawns generously coated with salted egg yolk sauce. See? I just said the magic word. Again, salted egg yolk sauce. I love that the flavor wasn't too overwhelming allowing you to enjoy more than one prawn without feeling too satiated. They also got the Spicy Crunch Prawn (S$6) which is a very similar version only it has more heat. I tried both and while I don't think this one was really spicy, I like this one more simply because it gave a more unique taste profile to the perfectly deep-fried battered prawns. Another yummy side dish was the Truffle Lotus Root Chips (S$3.50). 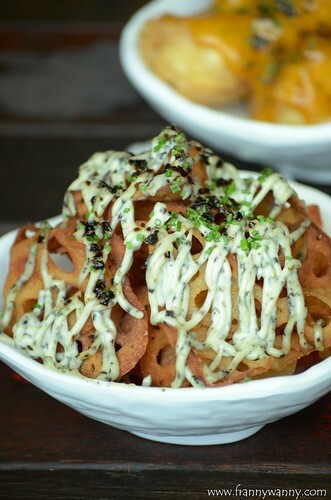 I'm not really a fan of lotus root especially when it's cooked in a soup broth so I was really surprise to try this unique and modern take wherein the lotus roots are sliced thinly, fried and drizzled with truffle mayo sauce. It's really addicting, no kidding. We also tried the Garlic Tofu (S$3) which tasted exactly like the one served with rice. I think they're just one and the same. Haha! Grilllo also serves an assortment of yakitori sticks (skewers) which may be ordered for sharing or perhaps together with a bowl of rice to make it into a complete meal. 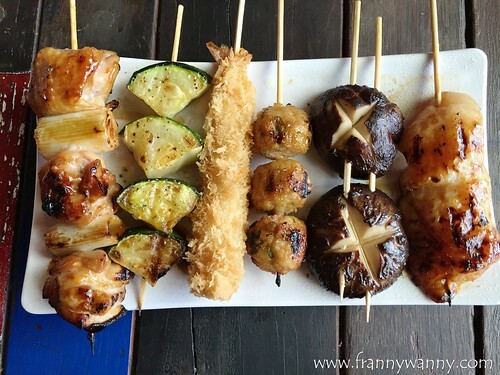 Here are the ones that we got to try that day (from left to right) : Chicken & Leek Skewer, Zucchini Skewer, Panko Prawn, Chicken Tsukune (meatball), Shiitake Mushroom skewer and Dory Skewer. If you look at it, you get a good mix of veggies, meat and seafood all on one plate. Big groups may also share a platter of the Grilllo Megapack (S$39.90). We had a delicious afternoon tasting session at Grilllo and this really got me telling Paul that PasarBella Suntec City is definitely much better than it's Grandstand counterpart simply because of the great variety of good quality food choices that you can find here. Grilllo is definitely one of them. Check out Grilllo at PasarBella @ Suntec (Stall 6), Suntec City 3, Temasek Boulevard, 01-455/461 North Wing, Singapore 038983.